So here is another summer blockbuster featuring giant robots fighting as buildings collapse around them. No…. wait… come back…… it’s not a Michael Bay Transformers sequel and its an original idea that isn’t based on a comic book or a re-make/sequel. Directed by Guillermo del Toro, Pacific Rim basic premise is giant robots vs monsters. Set in the near future, cracks form at the bottom of the ocean as a new dimension opens up releasing the Kaiju, creatures the size of buildings causing distraction in their path. To protect us all from these horrendous attacks, we create Jaegers, huge robot machines that act as guardians piloted by two people with their minds merged together working as one. Del Toro is the perfect choice to take on such a silly idea with his inner child revealing in the fun making Pacific Rim such a joy to watch. It reminded me very much of the blockbusters of the 80’s 90’s, where all it took was a redial idea with a sense of adventure. Most of the big movies these days try to have they’re cake and eat it by having massive things hit other massive thing as everything explodes while buildings fall down all the while aspiring as witty intelligent and meaningful. That’s not to say that you can’t have both but that requires a strong vision from the start instead of an after thought. 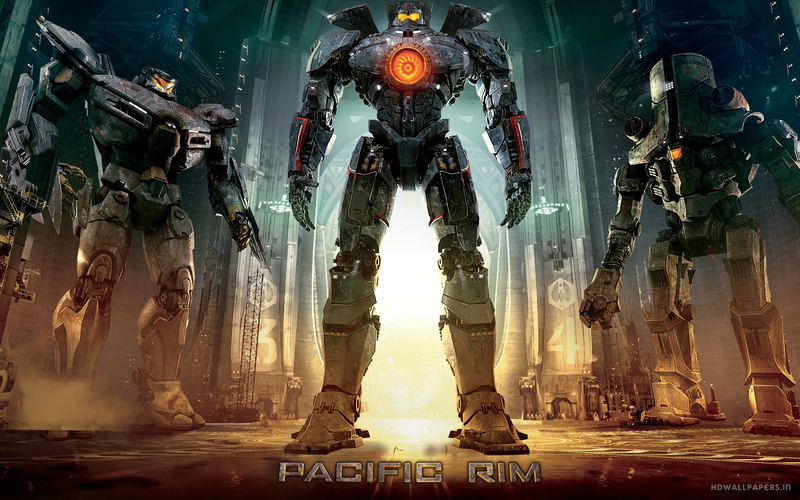 Pacific Rim is the former with its roots firmly set as solid entertainment with a warm heart at its centre. Character development and story maybe be lacking but is just about strong enough to get you through as the over 2 hour running time flies by. The dialogue is a bit choppy and that may sound like an over statement up until the point you realise that its been said by characters with such names as Stacker Pentecost and Hannibal Chau with robots fighting monsters. This is not a high water mark of cinema but you have to judge on its own merits and aspirations and Pacific Rim is nothing short of pure childhood fun and there is nothing wrong with that.. This entry was posted in Uncategorized and tagged Guillermo del Toro, Jaegers, Kaiju, Pacific Rim by Chris. Bookmark the permalink.